IATSE Local 411 was formed out to the need for a body to represent Production Coordinators in the Motion Picture and Television Industry in 1998. Before that time, Production Coordinators were unrepresented in the Province of Ontario. After being offered the opportunity to form our own local within the I.A.T.S.E., we accepted and were granted our charter to start Local 411 in 1998. For the first two years of our existence, we were under the jurisdiction of the I.A.T.S.E Head office in New York and the Canadian Office here in Toronto. With a Members Governing Board headed by then Director of Canadian Affairs James B Wood and Business Agent Ken Leslie Smith, the local found its feet, creating policies and setting agendas. We slowly started signing contracts for productions, gaining acceptance and recognition with in the Motion Picture Industry. Upon being granted our autonomy by the International in 2001, Local 411 appointed its first Executive Board, took up its own office space and set out to become an integral part of motion picture production in the city and environs. Under the guidance of our inaugural President Alice Ferrier and Business Agent Ken Leslie Smith, the local continued to grow, both in membership and scope. Local 411 developed training programs, established a Health and Welfare Trust fund and has signed contracts with every major studio and worked on almost all motion picture and television production shot in Toronto and now have approximately 180 members in the Production Coordinator Caucus. In the fall of 2002, Local 411 was approached to represent the on set Craftservice Providers working in the industry. Previously unrepresented, the Local secured the bargaining rights for the group and starting in spring 2003, began the process of creating a contract and bring this group into membership in the local. By the end of October, 2003, negotiations had concluded and a collective agreement with the C.F.T.P.A. (Canadian Film and Television Production Association) was finalized and ratified. With that, the Craftservice Providers caucus of Local 411 was formed. At the same time as the negotiations began for the Craftservice Providers contract in 2003, the Local entered into conversations about representing Honeywagon Operators. Starting in early January 2004, the Local once again sat at the table with the CFTPA and by the beginning of March had negotiated another contract for this new category. Local 411 is an affiliate of the International Alliance of Theatrical Stage Employees, which represents over 110,000 members employed in motion pictures, legitimate theatre and trade shows across North America. Local 411 works in tandem with all the other Unions, Guilds and Associations in the Toronto area and has jurisdiction for its members across the province of Ontario. We have dedicated professional members who have a broad range of skills and experience working on everything from documentaries to Oscar winning feature films. Our members form the backbone of every production, on set and in the office, working through all phases of production, prep to post. The Local, through the Business Agent, negotiates collective agreements with production entities that provide benefits (health/dental and rsp’s), sets out minimum rates and establishes standard conditions of work. The Local also provides a Member Assistance Plan for all its members. We are a freelance group, with no limitations on members ability to be hired based on experience and merit. The Local celebrated its 10-year anniversary in 2008. 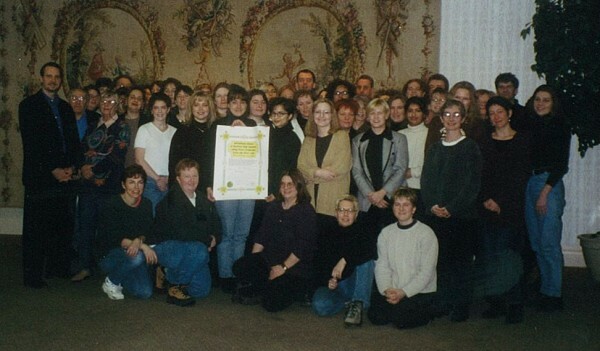 Below is a photo of Local 411’s founding members taken on the day the charter was signed in October 1998. Click here to see Local 411’s charter. 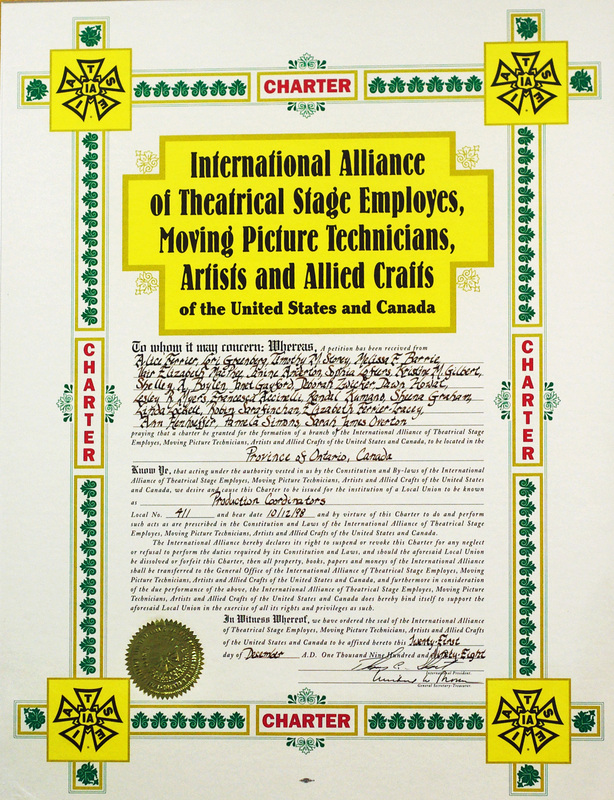 For more information on the history of the I.A.T.S.E, click on IATSE International in the ‘LINKS’ section of our website. For a list of who is on the IATSE Local 411 ‘Executive Board’ click here. While there are many websites where consumers can legally view streamed content, there are many illegal downloading/streaming sites. To find a list of legal content sites where you can download/stream movies and television shows legally go to: Motion Picture Association of Canada or Motion Picture Association of America. If you have information about the illegal production, distribution or sale of movies or television programs, send an email to: stoppiracy@mpa-canada.org or call toll free 1-800-363-9166. Copyright IATSE Local 411. All Rights Reserved.